The title says it all, this stylish home is a great option for a family who wants to be close to the lifts yet off the main road. 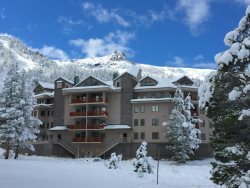 2018/19 Ski Lease Opportunity, $4,730/month + utilities, December-April, call 877.573.1888 or email today for more information and availability! Come enjoy the best of both worlds having a ski lease at Caples View at the Kirkwood Mountain Resort. Caples View is situated on the mountain and next to chairs 5, 6 & 7 and has comfortable easy access to the main road. The beauty of a ski lease is you come at the beginning of the season and leave everything for your convenience for the next mountain adventure. Kirkwood offers snow shoeing, cross-country skiing, alpine skiing and boarding, ice fishing, sledding, and tubing. Large sun soaked decks make for a perfect midday lunch retreat. Caples View has three clusters of duplexes on your own private drive off Kirkwood Meadows Drive creating a village like feeling. Luxury living in newly built homes offers granite counters, natural stone and wood accents throughout. Two master suites for two families work well with a queen bed and bunk bed each. The loft acts as a third bedroom with a large living space with an over-sized couch and queen bed. Three levels shows off the fantastic views looking out the floor to ceiling windows with decks on both sides of the duplex. Covered entries make life easy when heavy snows come to Kirkwood. A cozy open concept kitchen for all cooking needs. Through the expansive wall of windows there are great views of Timber Creek and Pyramid Peak off in the distance.